Whether or not you like the process of shopping for food, the key to a successful trip to the grocery store is putting together a good list. Sometimes this can make all the difference in not forgetting about the toilet paper or dish soap you so badly need. I was curious to see how many different apps for grocery shopping are available on the market, and of course there are many. For the purposes of our list, I decided to focus on apps rated with at least four stars and that are free to download. The grocery app world is full of apps that cost money, but these three do a great job despite without costing you extra money! Rated 4 stars. Free Download. I have the OurGroceries app and use it for weekly food shopping. What I like about it is my partner and I can share one shopping list between our two iphones and we both have the ability to add items. It has a very simple interface that allows us to create multiple lists according to where we shop, or even break down needed items into recipes. As you shop the items can be crossed off with one click, and all items are saved to be added another time. Available for iPhone, Android, and Blackberry. Grocery Smart by Handmark Inc. Rated 4.5 stars. Free Download. Grocery Smart sounds similar to OurGroceries. It supports syncing and sharing lists across multiple users and devices. Users can also add items via a web interface that can be updated to the app. This is really useful when one member of the family doesn’t have a smartphone, but they do have the internet and a computer. Lists can be organized by store, and also sorted by department, and items can be checked off as you shop. Simple Grocery List by Route 1 Software. Rated 4 stars. Free Dowload. The Simple Grocery List app aims to be as simple as the paper list you once kept on your fridge (or still do). It comes pre-loaded with the most common grocery items, which you can rearrange, add to, or delete as you need. Lists can be emailed from your device and also imported into the app from email. There are also multiple themes available for you to customize the interface. Do you have a favorite shopping list app we haven’t mentioned here? Please tell us about it the comments! Image by Sarah on Foodtree. People with food allergies have to stay more informed about the food they eat than the average eater. It’s often a case of life or death! As such, I was curious to do a bit of research into apps that cater to a restricted diet. Below, I’ve selected five of the most useful and interesting apps I came across that focus on helping people with allergies. I think this is an excellent variety pack of tools for people to use in coping with food allergies. Please let us know in the comments if you have more suggestions! MyFoodFacts is a useful tool for detecting food allergens in processed food products. The app uses the iPhone camera to scan the UPC barcode found on most food label packaging, and cross references this information with a database of thousands of food products. The app alerts users if an allergen is found they may be allergic to, based upon their custom requirements. This also includes common derivatives associated with with the list of allergens and intolerances. myAllergies Food Diary, by MyHealth Software Ltd.
MyAllergies Food Diary helps users track their daily intake of food and drink along with symptoms potentially related to food allergies (i.e. headache, rash, upset stomach, etc). The app includes an analysis tool to cross references a list of foods or drinks and identifies the links between these and the potential symptoms. Detailed results for each food/drink includes more specific information and a histogram showing your symptoms over time. Cook IT Allergy Free, by My Allergy Free Recipes, LLC. Cook IT Allergy Free is a recipe app that caters to people with food allergies. All the recipes are gluten-free but are customizable to cater to every type of food allergy sufferer. There are over two hundred recipes included in the app with more being added all the time. Each one allows the user to trade out allergen ingredients and substitute with a safe alternative that works with the recipe. Customized recipes can be saved to a grocery list of ingredients, or shared with others through email, Facebook, and Twitter. Available for iPhone & iPad. iCanEat OnTheGo is an app that assists users in making gluten and allergen-free food choices from chain restaurant menus. It includes places like McDonald’s, KFC, Arby’s and other fastfood restaurants and allows users to customize menu selections to eliminate food items they are allergic to. It’s healthier meal choices while eating on the go. If you’ve ever wanted to have more information about food additives at your fingertips, then this is the app for you. The Food Additives 2 app is a self-contained database of additives in food which includes information about affects on health, maximum daily intake, food products associated with the additives, etc. It’s especially relevant for those with food allergies because it allows them to lookup ingredients with those long scientific sounding names, which often turn out to contain allergens. This past holiday weekend, the Foodtree team spent two days at our local farmers markets celebrating food, farmers, and food lovers. It was a really exciting few days for us, especially because all of you were so excited about the app and the vision we have for this company! Each morning we set up a tent (solar-powered on Sunday!) and sent food lovers around the market looking for beautiful food photos, as well as where those foods were from. Everyone who participated got a gift and afterwards we awarded prizes for Most Photos and Best Photostream. The app hit the App Store last Wednesday for Vancouver and Boulder, Colorado…both cities have vibrant farmers markets in full swing right now. Early Saturday morning, the pictures started flying! The Foodtree Team was displaying real-time images of the photos being taken in Vancouver (we also checked in on Boulder). 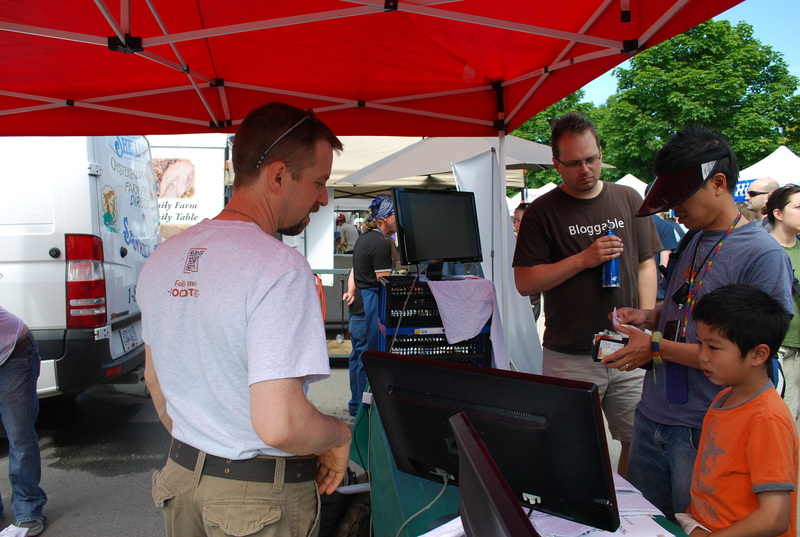 People couldn’t believe all the geeky tech at a farmers market! Our tent was bustling with inquisitive food lovers and locals who’d downloaded the app and wanted to give it a test drive. We offered demos, helped people install the app, and even loaned out iPhones for people who didn’t have them. Farmer participation was incredible…before the event we’d spoken with a group of the vendors about being a part of our scavenger hunt, but when we showed up and started setting up, vendors began stopping by asking to join in the fun. We were obviously happy to expand the photo scavenger hunts to include their tents. Our prizes for Most Photos came from the Roaming Dragon Truck team, who are a staple at the markets, and serve up some seriously delicious food. Look at the photos taken of their truck and menu here. Thanks again guys. 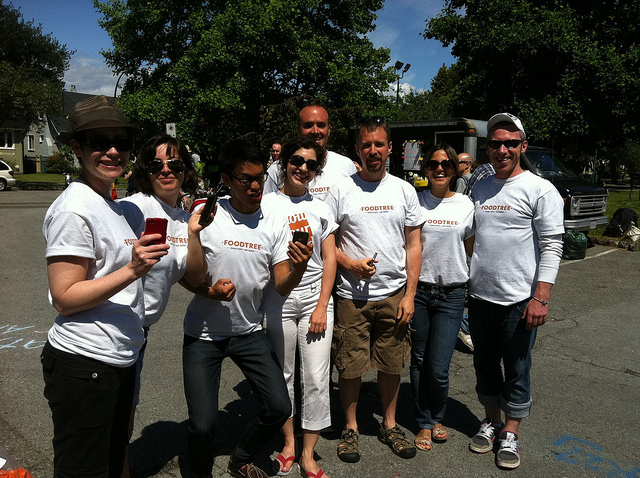 Of course we’d like to expressly thank the Vancouver Farmers Market team, who have been truly wonderful these last few weeks as we prepared to celebrate the vendors and our new app. You were a huge element of this celebration’s success, and welcomed an unusual promotion of local food into your markets last weekend. Steamclock Software, a local development shop run by Allen Pike, were instrumental in building the app itself and are forever highly recommended by us. EATart, a local art lab that promotes sustainable energy via art, was behind our solar powered panels on Sunday, powering all the laptops, iPads, and iPhones. In addition, we ran two special scavenger hunts on Saturday with some of the hardest working citizens and food advocates in town. The first involved Councillor Andrea Reimer, Chef Robert Clark (of C Restaurant among others), Tara McDonald (ED of Vancouver’s Farmers Markets), Amanda Gibbs (previously Museum of Vancouver’s Dir. of Engagement), and our very own CEO Anthony Nicalo. The second involved a few of the many wonderful food advocates we have in this town; Mark Busse (Foodists), Annika Reinhardt (SocialBites), Kaishin Chu (DashofFood), and Mijune Pak (FollowMeFoodie). Everyone involved took a ton of photos and gave us great feedback on the app, vision, and experience. Thank you for being a part of such a special event for us. 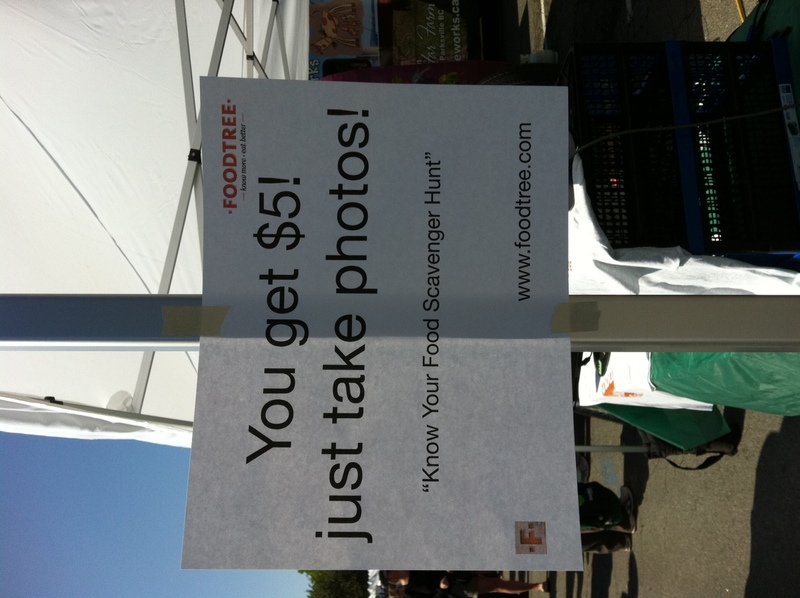 Oh, and a Special Thank You to Mother Nature, who has made it clear that she’s a big fan of Foodtree! What unexpectedly gorgeous weather this weekend! Run Your Own Scavenger Hunt! The response to this weekend was incredible, and a lot of fun for everyone. The magic was the connections made. Photo hunters noticed foods they’d never heard of. Chefs were introduced to farmers. Food lovers deepened relationships with particular vendors, and farmers saw their products being shared and celebrated all over the community. We want to spread that excitement! Ever since the event we’ve been working on a do-it-yourself package to enable anyone to recreate the event we put together. 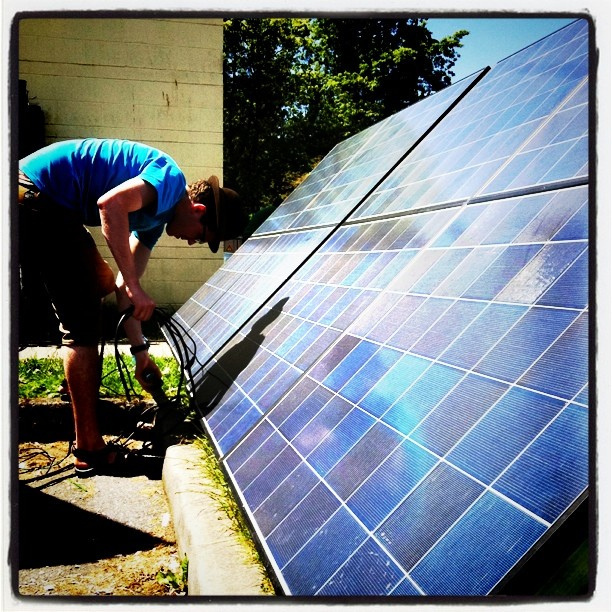 Don’t worry…solar power and flatscreens aren’t required:) Stay tuned! Since the event we’ve received lots of requests from farmers markets, farmers, and food lovers about including their locations and connections in the app. We’re hearing you, and we’ll be clearly outlining exactly how to unlock cities and get markets/vendors into the app really, really soon. If you have questions or would like to see yourself (or your community) in the Foodtree app, email us (friends@ foodtree dot com) or drop into our community forums to get started. Want to beta test our iPhone app? If you’re in Vancouver and you visit farmers markets, let us know if you’d like to be an early tester for our iPhone app, coming out late next month. Testing starts soon, and we want as much feedback and possible! 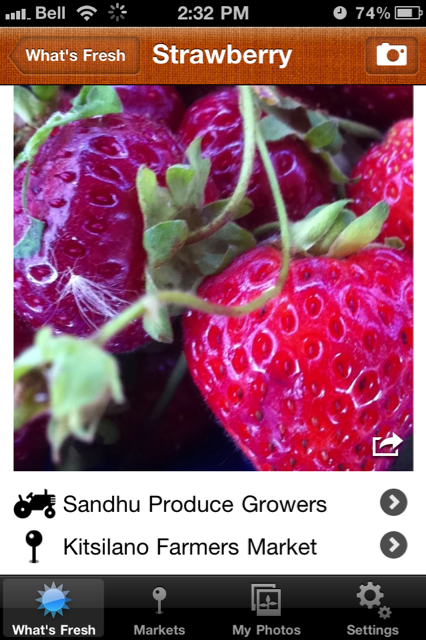 The app will focus on taking photographs of the food you’re seeing in our local farmers markets, with a nod to witnessing what’s in season while it’s in season! In order to get on the beta test list you just need to drop your basic info into this form. Screen shot above is not in fact from the app itself. 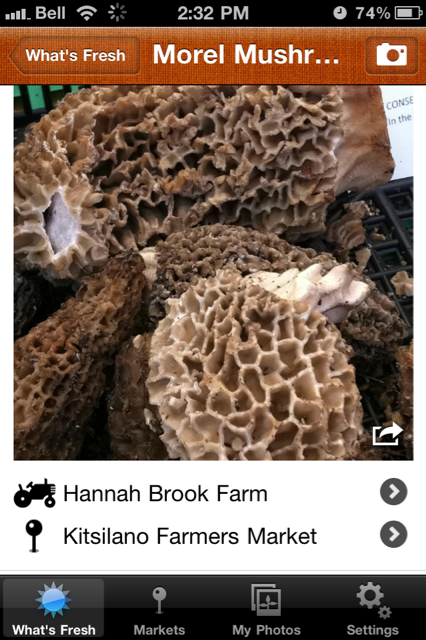 It’s actually from our mobile site, which you’ll see if you visit http://foodtree.com on your phone.